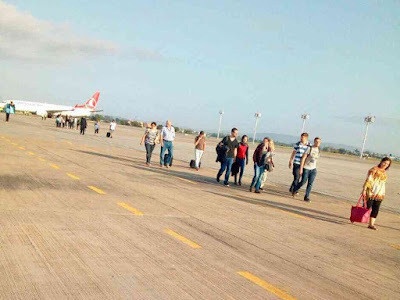 Turkish Airline developed Mechanical problems makes emergency landing at Moi International Airport, Mombasa -PHOTOS/VIDEO - Bana Kenya News, Real African Network Tubanane. A turkish airline made some rounds in Mombasa after it developed some mechanical problems. The Airline landed later at the Moi international airport in Mombasa. The number of passengers the airline had carried was not disclosed by according to the sources, the passenger were about 700 people. All the passengers were taken to Whitesands Resort and will stay there until further notice, said Turkish Airlines operations manager Mohamed Said. Coast regional coordinator Nelson Marwa said security agents took charge as soon as the plane developed the problem. "We are all safe. We thank staff for their cooperation," he said. Reports indicated an engine failed causing pilot Volkan Nihat to circle for hours as the damage was assessed. The plane landed safely at about 7.20 am. An officer at the airport earlier said there might have been an explosion had the plane landed. He said they were trying to prevent this and ensure the safety of all passengers. "The airline landed as requested and all the passengers are safe. People have been told to exercise patience as some of the people who boarded the plane are Kenyans from department of Migration. " a MIA official said.